The end of 2017 is approaching so fast! It feels as if I am on board of a hurtling train and it is scary. Most of us,I am sure are feeling pressured on so many levels. Financially, politically, environmentally and personally we are subjected to trials and tribulations. We may be feeling overwhelmed by all the problems and choices we are facing. It may feel as if we are being pulled in a hundred different directions at once. It is at such times we often feel like giving up hope. The words, "what is the use? ", echo through our thoughts. Doubt and fear stretch their ugly tentacles out into our thoughts and threathen to take our hearts and dreams hostage. We may even become skeptical. Being skeptical is the archenemy of hope, it taints our beliefs and shackles our joy. We often hide our fear of failure, of getting hurt behind the ugly mask of skepticism. It is the armour of somebody who is scared of their own vulnerability. It is their hideout from disappointment. If this is how you are feeling I want to tell you about a powerful antidote. No, I cannot give you any guarantees that you will not be hurt, or that you will be successful or be given all the right answers. I cannot make any promises. However, I can tell you that this antidote will lift your spirit, it will give you peace and it will guide you. It is faith. Faith casts away fear, and it tramples despair. Faith lifts us on wings of hope and it restores our energy. Have faith that God will guide you, He will answer your prayers and when you walk close to him he will protect your heart. 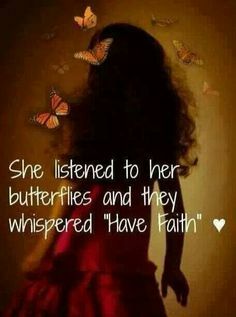 Listen, listen closely...hear the whisper : have faith.